Columbus, named Isla de San Jorge. 28 Jan 1623 Saint Christopher's (St. Kitts) an English colony. 1625 French also settle on Saint-Christophe (see below). 7 Sep 1629 - 1630 Spanish occupation of English and French colonies. 11 Apr 1666 - 5 Jul 1671 French occupy entire island. 25 Jan 1671 - 16 Oct 1816 Part of Leeward Islands colony (see Antigua). 15 Aug 1689 - 24 Jun 1690 French occupy entire island. 16 Jul 1690 - 13 Jan 1699 English occupy entire island. 16 Jul 1702 British annex the French part the island. 22 Feb 1705 French attack and pillage St. Christopher. 11 Apr 1713 English possession confirmed by Treaty of Utrecht. 12 Feb 1782 - 3 Sep 1783 Occupied by France. and the British Virgin Islands. 19 Dec 1832 - 1 Jan 1960 Part of the Leeward Islands (see Antigua). 13 Apr 1980 Renamed Saint Christopher and Nevis. 19 Dec 1980 Final separation of Anguilla. 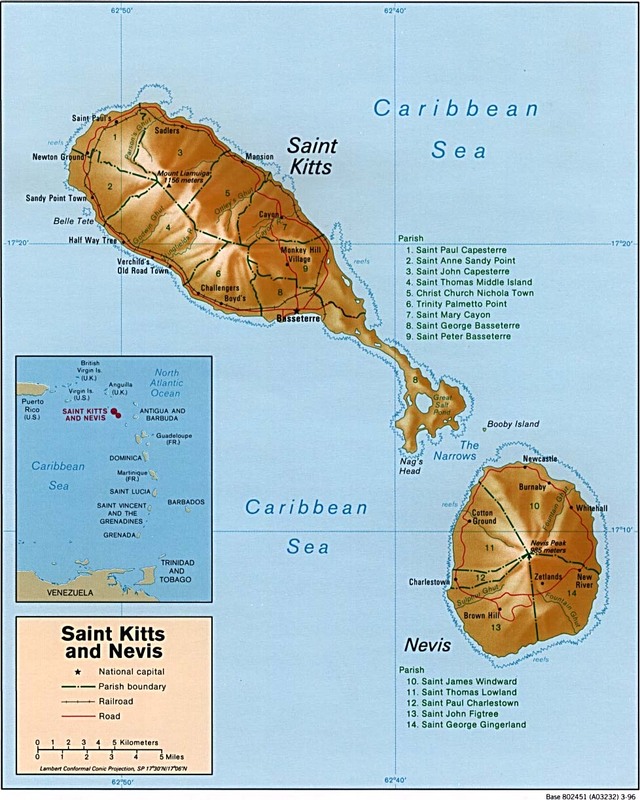 Nevis); Nevis granted limited self-government. 10 Aug 1998 Nevis independence referendum fails. (b) from 1983: "By the Grace of God, of Saint Christopher and Nevis, Queen, Head of the Commonwealth." Territorial Dispute: Joins other Caribbean states to counter Venezuela's claim that Aves Island sustains human habitation, a criterion under UNCLOS, which permits Venezuela to extend its EEZ/continental shelf over a large portion of the Caribbean Sea. 1625 - 1635 Under Compagnie de Saint-Christophe rule. 7 Sep 1629 - 1630 Spanish occupation of French and English colonies. 1635 - 1651 Under Compagnie des Îles de l'Amérique rule. 1651 - 1665 Saint-Christophe a seigneury of the Knights of Malta. 1665 - 1674 Under Compagnie des Indes Occidentales rule. 16 Jul 1702 British annex French part as part of St. Kitts. 12 Feb 1782 - 3 Sep 1783 French occupy entire island (see above). Province, also called Carliola) . 22 Jul 1628 English colony (until 1671 subordinated to Barbados). 17 Jun 1629 - 1630 Spanish occupation. 25 Jan 1671 - 1816 Part of Leeward Islands colony (see Antigua). 21 Mar 1706 French attack and pillage Nevis. 14 Feb 1782 - 3 Sep 1783 Occupied by France (named Niévès). 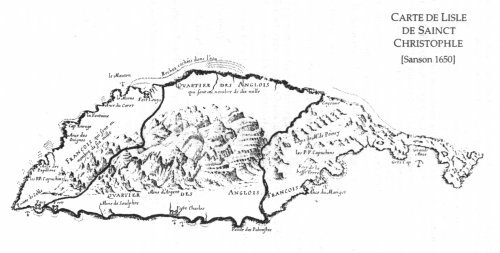 1882 Part of Saint Christopher-Nevis-Anguilla colony. 19 Sep 1983 Part of independent St. Kitts and Nevis, with limited self-rule. 13 Oct 1997 Nevis parliament votes for separation from St. Kitts. 66.7% was required for approval. 1702 - 1703 Christopher Codrington?